Indian Mound was a small, rope tow area that operated in the town of Newton, most likely during the 1970's. The area was closed before 1978, according to R. Berthel. It operated with a wide slope, and a few woods trails. Lots of details can be found by reading various visitor's commentaries below. Betsy McDonough and I visited this area in 2000. We basically just looked at it from Thornell Road. Not too much to see: a wide open slope mainly. 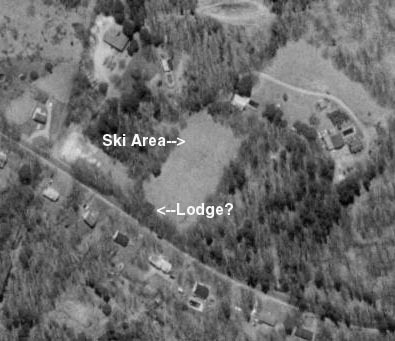 However, we did see what looked to be a small base lodge which is only 20ft or so off the main road, check out the overhead pic below to see it. This area is on private property and we would recommend that you view the area only from Thornell Road, and don't trespass. Steve Estabrook, first told us about his ski area: "There was a ski area in Newton NH on Thornell Road called Indian mound ski area. It is closed now but the poles from the rope tow stil remain." Alex Speidel: Yes, there was a ski area off of Thornell Rd. in Newton, NH (on the left side of the road heading west from N.H. Rte. 108). You can see it on old USGS maps (from the '60s and '70s). I believe that the Timberlane High Ski Club went there in the 1970's on their trips. I couldn't believe that there was a ski area there, but it's true. Your web site is very interesting; I thought I was the only person interested in abandoned ski areas. It's too bad that small, inexpensive areas are disappearing. A view of the area on a topo map, 1988. Thanks to Randy Percival for giving us this link. A view of the area from above. What is most likely the lodge has been annotated. As you can see, the area was fairly simple. It is likely that some woods trails were located in the woods to the right of the slope. 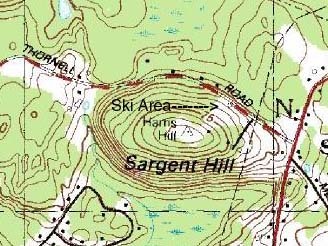 Brad Miller: I have information on the Indian Mound Ski Area, in NH: In examining a 1972 USGS quadrangle topographic map (Haverhill, MA/NH; 1:25,000 scale), the former Indian Mound Ski Area is clearly indicated. It is located off Route 108, on Thornell Road, about 0.75 miles south of Newton, NH, and several hundred yards west of Sargent Corners, on the northeast side of Sargent Hill. There appears to be only one lift at that time. An unimproved access road leaves Thornell Road to a facility or lift building located high upon the hillside, near the summit. A later topographic map edition (1977) indicates a similar layout; the 1985 topographic map does not show the lift line or access road, but does depict an abandoned structure or building on Thornell Road, and minor development (likely residential homes) adjacent to the eastern limits of the former ski area. The building near the summit was still indicated. Not surprisingly, a 1955 topographic map only shows open land where the ski area was later located, which at that time was probably just pasture or orchards. Robert Zock: Indian Mound is basically the front, sloping yard of the owner of the property. It probably would be hard to find as a "ski area" on terra. I don't remember the name of the owner, however in 1995 I bought their old grooming vehicle - a 1963 Skidoo Alpine - one of the early ones. "Indian Mound" can be made out on the fiberglass cowl of the machine. The owner was a machinist and built the rope tow. The posts and sheaves were still there when I visited. The owner mentioned that they had some trails in the woods as well. Tom Cronin: I've lived in Newton, NH for the past 13 years. I read the note from Steve Estabrook. Yes, many parts of Indian Mound are still visible today. Some tow components and the original base lodge is located about 300 yds west of the intersection of Rte 108 and Thornell Road. The lodge is still in pretty much it's original condition and until recently was used as a craft store. The original parking area still exists and was used by the craft store for customer parking. Indian Mound had a slope on the Thornell Road side of the hill and some trails on the back side. The hill is visible from Rte 108 and just south of the intersection when the leaves are down, you can still see where the trails led off the back side of the hill. The Bakers (owners) still live on the property and were also the builders of the ski area in the early 60's and craft store owners. I had heard that due to liability costs, it proved eventually to be not profitable to continue. Dave Houghton: I think Ernst Foster taught lessons here in the Mid sixties and then went on to head up the ski school in Bradford before moving to Germany. Basically, my recollection is as follows: The front side of Indian Mound was a single slope with a small (30 X 20 ish) base lodge. The modern facilities consisted of an outhouse by the parking lot. The picture you have on the site with Base Lodge? (aerial) is correct. The parking lot was the area to the left level with the base lodge. The front slope was easy skiing and had a rope tow running along the right side as you look up the hill. There were speakers on the tow poles and music would be playing (I can distinctly remember, Those Were The Days by Judy Collins??). All the local kids skied here. Vertical drop here could not have exceeded 100 feet. Many times there were jumps built from snow. The lodge had a small counter to the right as you entered and candy and sodas were available (I am sure there were other items but for me it was Charlston Chews and Grape soda in glass bottles). There was a wood stove I think in the center where you would dry out those nasty ski gloves made of some kind of white/grey leatherish material that were always worn and soaked from the tow. Three pair of socks were the norm over the lace up boots and front latch bear trap bindings. Later, in the late 60's we got buckle boots and step in bindings. The back side of Indian Mound was where the brave went. This was black diamond action for us as small kids. There was a second rope tow that came up somewhere beyond the front slope tow but the rope went perpendicular to the front slope going down to the left and back if you were looking from the top of the front slope. It was very flat a the very top, there were a number of ways to get down the back but it has become somewhat hazy to me. I know that there were routes through the woods that switchbacked a bit (I am talking about trails about eight feet wide at best) and then opened up onto a steeper slope about half way down or less. I seem to remember a way to get back to the parking lot side this way (traverse) or the "dreaded" back rope tow. As a chid age 6-10 rope tows could be a challenge due to the weight but this tow had major size bumps in it within the wood section and was fairly narrow for most of it's distance. If you fell you screwed everyone up. We used to pray that it would not stop. I can remember holding that rope with my hands dragging the ground under it as I could no longer lift it. We would attempt to wait for adults to get on in front of us. I have skied all over North America and British Columbia but Indian Mound remains one of my fondest memories ever. I even stop by once in a while and pull into the old parking area just for a peek. 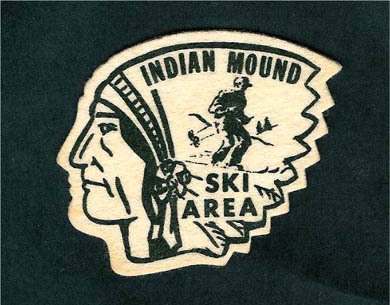 Keith Miller: I skied at Indian Mound after school in the late '70s. I too attended Timberlane schools. No doubt I was in that ski club from school. The "Bradford Bump" is the local hill of choice for our schoolkids now. I used some old skis with spring bindings and leather dummy straps to learn on. Which is worse, yardsaling and eating your strap attached ski or chasing that runaway down to the warm up hut? "It's better to look good than to feel good," I guess! :-) Maybe that's how the phrase was coined. Went by there a month ago. Still looks the same! Here's a patch from Keith.